Did you already strain the coffee? Ya colaste el café ? is a classic question in the Cuban mornings. To have strained the coffee and to have taken it ,represents in Cuba the best guarantee to face a new day and with him its challenges. 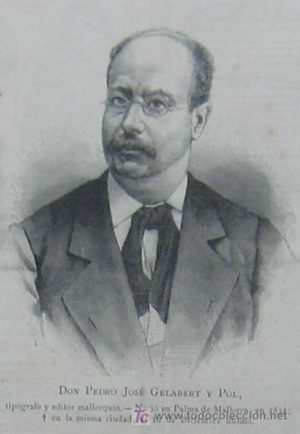 Don José Gelabert founded in the Wajay, in the outskirts of Havana, the first coffee plantation of the Island about 1748 with seed originated from Santo Domingo, current Dominican Republic. With the first coffee plantation in Cuba, French and Haitian immigrants arrived, who fled their country in 1789, after the outbreak of the revolution,acquiring land that the Spanish sold at a very low price. At that time, forests still covered most of the island, creating the necessary environment of high humidity,undisturbed soils and fresh climate. The first migrants settle in the region of the Sierra Maestra Mountains and Guantanamo where they built their huge stone houses. 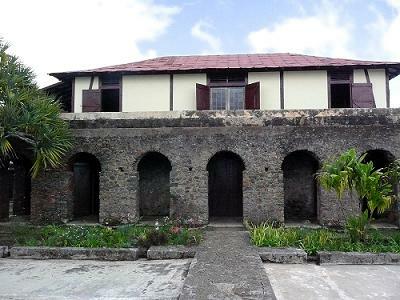 The Isabelica located in the coffee region of the Sierra Maestra declared Patrimony of the Humanity for the UNESCO,was constructed in the XIXth century by Constantin Rousseau.Then the farm had an extension of 1.700 knighthoods and had 30 slaves, between whom beautiful Maria Elizabeth was standing out. The Frenchman fell in love with the young woman, married her and baptized the plantation with the name of the woman, The Isabelica. The name has remained until our days. 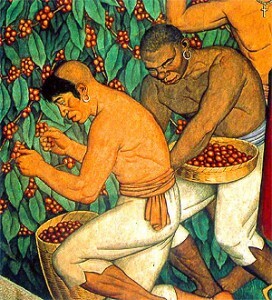 The coffee tradition spread over the whole Island and a rich culture bloomed concerning the valuable seed. CUBA has the biggest quantity of ruins of coffee haciendas in the world with archaeological value,many of them excellently well preserved in areas that have been declared by the UNESCO Patrimony of the Humanity. In Las Terrazas, between Havana and Pinar del Rio, you find more than 60 of them. The most representative ruins that still preserve are: Buena Vista and La Union in Las Terrazas, The Isabelica,in Sierra Maestra and The ranch of Don José Gelabert, in the Wajay. By 1790, Cuba was already exporting 185,000 Quintals (18500 T) a year to Spain. 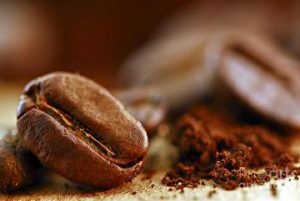 In the beginnings of the XIXth century Cuba became the first world coffee producer – exporter, and the Cuban people had fallen definitely in love with its flavor. But already about 1830 it was losing force,due to the mediation of Spain in the commerce of the island Today, Cuba’s coffee plantations are located mainly in three regions. The most important are on the slopes and valleys between 1,000 and 2,000 ft, located in the Baracoa and Sierra Maestra mountains of eastern Cuba, the Escambray Mountains near the center of the island and the Sierra del Rosario, close to the western tip of Cuba in the province of Pinar Del Rio. 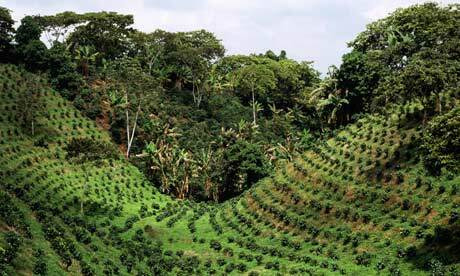 Coffee Arabica is the most cultivated coffee in Cuba within his variety, Typica , Bourbon, Caturra : yellow and red, Actual : yellow and red, San Ramón, Villalobos. 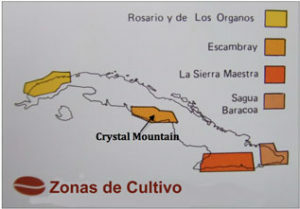 Cuban coffees are classified as Crystal Mountain, Extraturquino, Turquino, Altura, Montana, Cumbre, Serrano superior, Serrano corriente and Caracolillo (oval shaped). The finest of these is Crystal Mountain, which is now being sold on the Japanese market. 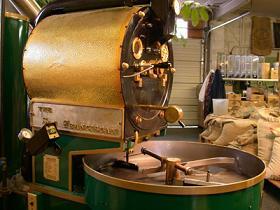 After finding the highest quality green coffees available, the roasting process can begin. Roasting coffee is not a science, but rather an art, and it takes a lot of skill to know not only what roast level will bring out the maximum flavor. The coffee beans are roasted with a drum roaster and the roaster use his eyes, ears and as well his smell to determine when the coffee beans are done roasting. Coffee can be roasted to many different roast levels: Coffee of excellent fragrance,very fine and delicate aroma,good balanced body,good acidity, with some citric notes,pure,delicate, soft and sweet flavor.When coffee is roasted, the bean undergoes a series of chemical reactions that transform it to its ultimate consumable state. In Cuba, the cafe is an inseparable part of the identity and every day’s life of its people. The day does not begin until the aroma floats in the air and the lips tasting the “coffee buchito . A good host in Cuba is not conceived if he does not come up a steaming coffee in the Reception. Phrases such as “Let’s make a coladita”. “Do you want a coffee buchito”, shape the golden rule of the Cuban courtesy.